Troubleshoot A Propane Gas Grill – Are you having problems getting your gas grill to spark or ignite? Propane gas grills are the perfect grilling solution as they are ready to use as soon as you light them. There is no need to use with charcoal, lighter fluid, or waiting for a charcoal grill to heat up. Sometimes a gas grill does not light, but there are some easy steps to troubleshoot and resolve the most common causes. The first step to troubleshooting is to turn everything off and wait for 5 minutes, allowing excessive gas to dissipate before doing any work on the tank and grill. You will also want to smell for propane, which can smell like rotten eggs, a skunk’s spray, a dead animal or garlic. These smells are added by propane manufacturers to alert customers to propane leaks. There are a couple of methods for checking if your propane tank is empty. The most common way is to fill a cup or small bucket with hot tap water. Pour the water down the side of the tank and run your hand along the tank to feel for a cool spot. Propane absorbs the heat from the water. Therefore the metal wall of the tank where the propane is will feel cool to the touch. Another method to see if your propane tank is empty is to use the weight of the tank. 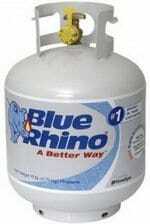 Propane tanks have a TW, or Tare Weight stamped on the handle. To measure how much propane you have left, weigh the tank and subtract the TW number from the weight. Many propane tanks have safety features built into the gas regulator and tubes that can be triggered by leaks in the tank. The most straightforward method for finding a leak in your tank is to use a soap and water solution on the outside of the tank. The soap will bubble at the point of the leak. If you find a leak, take the tank back to where you purchased it and ask for a replacement. The regulator on a gas grill is the part that screws onto the propane tank to regulate the flow of gas. It has a safety mechanism that is called a bypass. 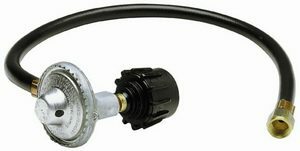 This bypass automatically shuts off the gas supply when there is no back pressure in the hose. This can happen if there is a leak. The valve also can also “trip” if the gas tank is turned on while one of the burners is also turned to the on position. To try and reset this, turn off all burners and the gas tank. Turn on the gas tank and wait a few moments before turning on one of the burners and attempting to ignite it. The same safety features mentioned can be triggered if the tank is not correctly attached to the grill. Follow these steps to disconnect and reconnect the tank to the grill. If the issue is not with the propane tank or the connection of the tank to the grill, the problem may be with the grill itself. You will want to check the gas flow to the grill. Step One: Check the igniter. Locate the igniter on the grill and watch when activating the igniter for sparks, indicating the igniter is working. If not, identify what kind of igniter you have. Some grills have battery powered igniters, and it may just be as simple as replacing the batteries. Others are push-button igniters and could be failing due to a clog or bad wiring. If it is clogged, very carefully clean the igniter and the burner tubes and try again. If it is faulty wiring, have a professional replace the wiring. Step Two: If the igniter is sparking, it is time to move to the burners. Turn on the burner and carefully try to light them with a long-handled lighter or match. If the burners are not lighting, this could be caused by a lack of gas flowing through the pressure regulator. Your grill’s manual should include instructions on how to reset the regulator. If resetting the regulator does not work, you may need to replace the regulator. Most propane gas grill issues can be resolved with the steps above. Be sure to use caution, or consult a professional, when working with propane. Contact us below for more tips and tricks. Next post: TV Will Not Come On – What To Do?